Here are some facts about the Globe Theatre, London. 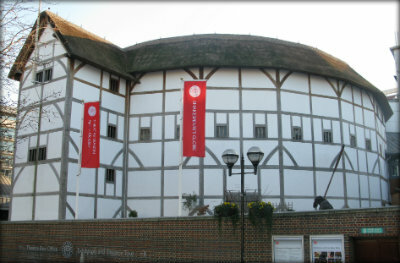 The original Globe Theatre stood in Southwark, London, on the south bank of the River Thames. Today, an accurate replica stands on the site of the original building. The Globe was built in 1599, by the acting company of which William Shakespeare was a member. It burnt down in 1613, was rebuilt the following year and then demolished in 1644. The Globe was an open air theatre, with three floors and could seat about 3,000 people. The stage measured about 27 by 43 feet and was raised off the ground to allow access by a trapdoor. The Globe Theatre regularly showed up to 10 different plays in just two weeks. The plays often incorporated special effects, such as acrobatics, fireworks and even a real cannon firing. Shakespeare was a part owner of the Globe Theatre, and several of his plays were performed there, including Hamlet, As You Like It and Macbeth. A visit to the Globe Theatre was a big event. As well as the play, there would be music, food and drink and many businesses complained that their employees were going to the theatre rather than to work. Advertising was also important in Shakespeare’s day and the Globe would fly colour-coded flags to indicate what was playing. A black flag meant a tragedy, while a red flag indicated a historical play. The new Globe Theatre was built in 1997, following a 20 year campaign by the film maker Sam Wanamaker. Wanamaker’s vision was to build a replica of the Globe as it would have looked in Elizabethan times. The authentic replica was made from wood and has London’s only thatched roof. There are no microphones or speakers and the music is played live on period instruments. Today the Globe Theatre offers guided tours of the facility, as well as an exhibition of life in Shakespeare’s London. The theatre attracts over 200,000 visitors every year. What next? Discover more facts about the theatre in Elizabethan England, or learn more about the Tudors. Well spotted! Thanks for letting us know. The change has been made! really interesting facts thanks this will help me in my report. very helpful. this website helps me alot with homework! Helped me so much with homework!!! Great website! Thanks so much for the amazing facts!!!!!!!!!!!!!!!!!!!!!!!!!!!!!! Hi! This facts helped me so much! Thank You!! These facts helped me so much with my home work !!!!!!!! Amazing website! Great for HW! this website helped me revise for my history test thanks soo much! !